So, you’re planning on making your own home studio, or maybe simply want to record the vocals on your new song and are looking for the best recording microphone? Sure, you might have a bunch of various different microphones laying around, but which one should you use? While you could technically utilize pretty much any mic for vocal recording, in order to achieve the best possible results, you need to take a couple of things into consideration. That’s why we’ve come up with an article that will provide you with all the necessary pieces of information regarding this type of microphones, as well as our list of the best ones on the market. I recommend reading through my buying guide first so you understand what to look for in a recording microphone, but if you just want to see my favorites, check them out directly below. Used by musicians all over the world, if you want the best look no further. Used by numerous famous singers ranging all kinds of different genres, it’s obvious that Shure did something right with the SM7B. Sheryl Crow, Serj Tankian and Michael Jackson, to name a few, went with the original model, with the SM7B being the newer, updated one. Very similar to the MD421 II by Sennheiser, this model offers a very high max SPL as well, meaning that you can easily use it for various other instruments, and even drums. In terms of performance, most of the positive feedback comes from the male vocal community, as this model can handle lows amazingly well. You can even compare it to similarly priced condenser mics and have it easily beat them. Controls include bass roll-off as well as mid-range emphasis and presence boost control. It’s exactly this and the high-quality electronics inside that make it so versatile and easy to use. 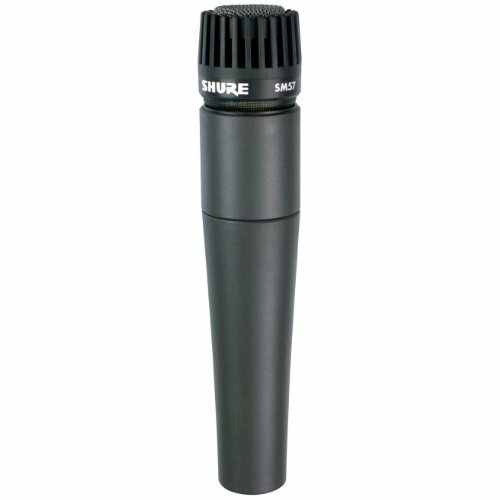 ​So, if you trust only the professional musicians, and want only high-quality equipment for your studio, the SM7B by Shure is once again the way to go. If you don't have the cash to splurge on a Shure, you can't go wrong with the P420. Top of the line technology from a dependable brand you can trust. Much like Audio-Technica, AKG is praised as one of the best audio brands on the market. Let’s see what their P420 condenser microphone has to bring to the table. The P420 is relatively inexpensive, but can still guarantee excellent performance. What makes this model unique is the ability to toggle between various polar patterns. 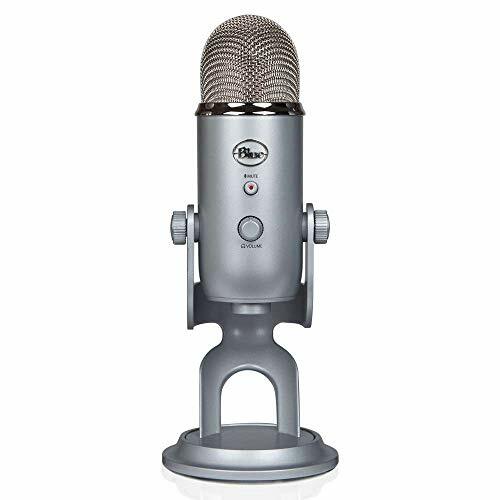 Much like the Blue Yeti, the P420 offers cardioid, omnidirectional, and figure 8 patterns. Depending on the occasion, you can easily switch to a suitable preset. Use the omnidirectional pattern for recording multiple people at once, or for experimenting with various microphone positions and setups. As it offers a max SPL of 155dB, you can count on the P420 to give you warm and natural sounding recordings, no matter what the style of singing or genre in question may be. With enough time spent on finding the right position, you can even use multiple P420s for some great sounding ambient recordings if that’s what you’re looking for. 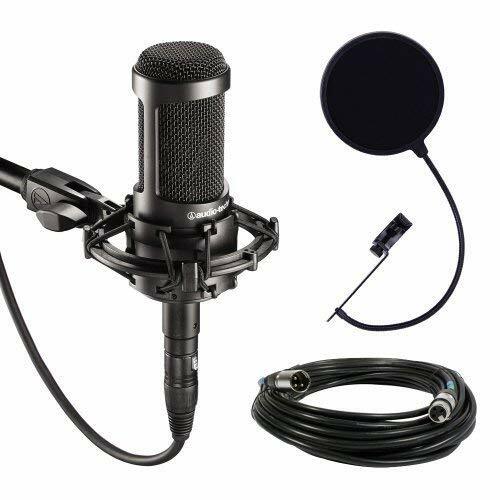 Perfect for much more than studio recording, this model will easily replace any microphone you may need for other occasions, such as podcast recording, or casual PC use. 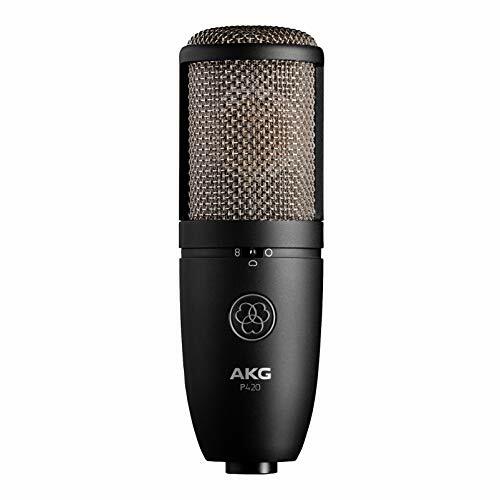 There is hardly a better multi-pattern condenser microphone than the AKG P420, both in its price range and the next one! Don't let the price tag fool you. This microphone is a great value and perfect for beginners with a smaller budget. 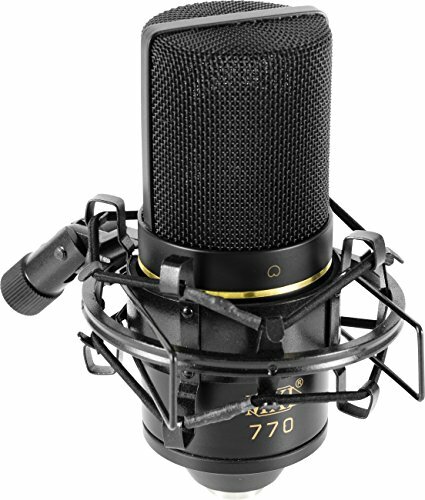 Starting out with the cheapest model on our list, the MXL 770 is possibly the best budget microphone for recording vocals you could get. For less than $100, you will be getting the microphone itself, a shock mount, as well as a very rugged storage/carrying case. You can hardly find a microphone at this price range that offers all that. The build quality of this model is surprisingly good. An all metal construction not only gives it a nice, heavy feel, but it seems that it can take quite a punch as well. From the looks of it, it will last a long time if you take good care of it. As it is a condenser microphone, you can expect a lot of detail. Given the fact that it offers a nice and wide frequency response range, it is pretty versatile across various different genres. The high end of the range benefits female vocals, as it conveys the high pitched notes in a very natural fashion. The low end doesn’t fall far behind, though we wouldn’t really recommend it for recording growl or similar techniques. It really shines for recording genres such as rap or R&B. Depending on the EQ settings, it can sound pretty warm and balanced. The 770 by MXL proves to be very useful for recording instruments as well. You can utilize it for anything from an acoustic guitar, to even maybe drums, as an overhead, if you position it properly. 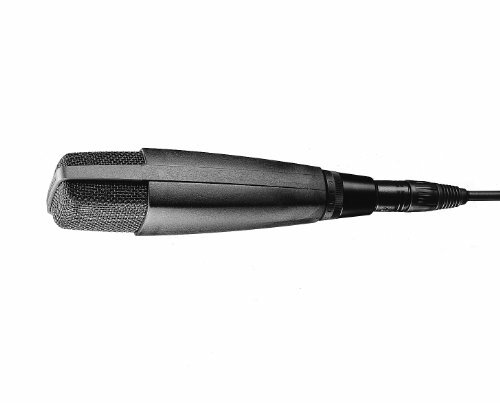 All things considered, the 770 by MXL is an inexpensive microphone, which both the beginners as well as more advanced musicians and studio technicians will appreciate. If you’re looking for a versatile mic that you can use for more than just recording vocals, definitely consider getting this one. If you care about aesthetics, the SM57-LC looks great and sounds even better. Shure is a company that practically needs no introduction. Both the SM58 and SM57 have earned the reputation of being the most commonly used microphones amongst musicians. As the SM58 is focused more towards on-stage use, we’ve chosen the SM57 as an inexpensive, yet great performing model for our review. Don’t let the relatively low price tag discourage you, as this model is virtually a legend by now. You can even find videos of Obama using it for his speeches. Though once again, some musicians may argue that for the best possible results when it comes to recording vocals, you need to use a condenser mic, the SM57 is a golden exception to that rule, even by their standards. As it can capture sound coming from a specific angle, and at the same time, decrease the unwanted noise to an avid level, it’s perfect for recording vocals. The build quality of the SM57 is amazing considering the price. However, microphones, in general, are pretty fragile, so don’t just go dropping them on the stage like you don’t care. With a slightly more narrow frequency response range than the previously mentioned model, you would expect a noticeable degradation in performance. However, unless you plan on recording extremely low or high pitched audio, that won’t be an issue. As for versatility, well, it’s got that covered too. I’ve personally used multiple SM57s for recording drums in a studio I’ve worked in. Guitars, both electric and acoustic, sound great when recorded with this microphone. S(h)ure, there are definitely microphones that offer a better performance, but for under $100, you can hardly find a better sounding, more solid feeling, and more versatile model. This USB is surprisingly versatile and perfect for mixed-use or beginners. Okay, we know, this one is a bit controversial. The Blue Yeti is generally considered as a microphone that focuses primarily on gamers, YouTube artists, and Twitch streamers. However, due to its practicality, good specs, and overall affordability, we’ve decided to include it in our review. Let’s see what makes getting a Blue Yeti for recording vocals actually a good idea. Starting with the form factor, it’s obvious that this microphone is focused towards desk usage. You can use it with a desk mount, but can always screw it on a standard microphone stand. The Yeti is a USB microphone unlike the others in our review. While you would normally use an XLR connection, having this option for connectivity makes things much simpler. Besides the USB cable, it hosts a 3.5mm headphone jack for on-the-fly monitoring. The controls on the microphone itself give it additional versatility points. You can easily and quickly choose from cardioid, bidirectional, or omnidirectional polar patterns. It’s clear that you can record almost anything that comes to your mind with the Yeti, and not just vocals. Besides the polar pattern switch, there are also headphone volume, gain, and mute controls. Featuring high sensitivity and great noise cancellation, depending on the polar pattern you’ve chosen, the Yeti performs amazingly well. The whole frequency range sounds natural, without any unnecessary boosts at any part. With great audio performance and switchable polar patterns, the Yeti turns out to be more than just a podcast USB mic! At number 6, we have a real treat coming from Audio-Technica. They have been one of the leading audio companies for many years now, and their AT2035 condenser microphone shows exactly why. Probably the first things most people notice with this microphone are the design and feel. The full metal exterior not only makes it very aesthetically pleasing but pretty durable as well. Looking at the specs, we can see that the frequency range it offers is pretty standard. However, what makes it special is the fact that it offers a max SPL of 148dB, as well as a -10dB pad. This means that you can give it everything your voice can offer, and still have a good sounding recording. Most of the background noise is easily canceled out, and the cardioid polar pattern makes sure all of the audio coming from a single direction gets picked up clearly. The level of detail that the AT2035 provides is superior when compared to other, competitor models at this price range. As for versatility, the AT2035 can be used for recording acoustic instruments as well. However, its performance is at the highest level when used for vocal recording sessions. This model comes with a 10ft XLR cable, a pop filter, and a microfiber cleaning cloth, so you basically only need a microphone stand and you can use this puppy straight out of the box. ​Going for an Audio-Technica product has always proved to be a good decision. The AT2035 condenser microphone is a great long-term investment, bound to provide you with natural sounding and detail-rich recordings. Reaching the middle of our reviews and somewhat of middle ground in terms of price, we have the NT1A mic package by Rode. Rode is a brand that’s famous enough that it doesn’t really need a special introduction. Their NT1A microphone won the EMEC award in 2004 and has been one of their best selling products since. Let’s see what it has to offer. For a bit less than $200, you will be getting more than just a mic. The anniversary package includes a shock mount, a cover, pop filter, and an XLR cable as well. Pretty much everything you need to start using it immediately. This microphone not only looks sleek but feels weighty and solid. As a standard cardioid and condenser microphone, with a standard frequency range, we didn’t really expect much from it. However, it turned out to be pretty good. The vocals recorded with this puppy sound balanced and on point. It’s definitely a great choice for anyone looking for a flat yet very sensitive microphone. The NT1A by Rode allows you to accurately capture vocals so you can play around with the EQ and effects in the mixing process. As expected, acoustic guitar sounds amazing when recorded with this mic, with the most discreet details such as fingernails scratching the strings being easily captured. 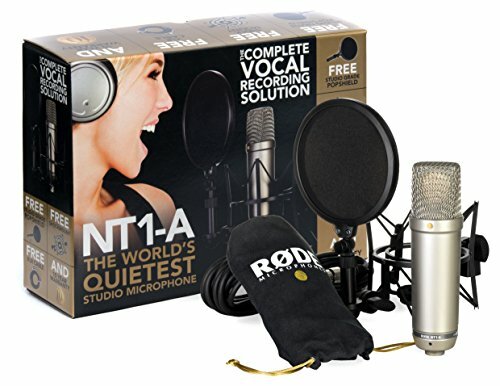 The NT1-A Anniversary Package by Rode is a reasonably priced bundle which allows you to record great sounding audio, whether it’s vocals or instruments. At number 8 is the sE2200a II C by SE Electronics, a company that may not be as popular as the rest that we’ve mentioned, but can certainly make a solid microphone. The first version of this model was even used by Amy Winehouse for recording some of her songs, and the new, updated version, has a couple of new tricks to offer. All of the original features that users liked are, of course, still present, with the most obvious difference being the rubberized finish and the shock mount that’s now included. Spec-wise, the sE2200a II C is pretty similar to the previously mentioned Rode model, but with a hand-made gold-sputtered diaphragm that makes it stand out and offer a unique feel. The actual performance of this model is where you can feel the difference. It sounds much more natural and offers way more detail than most other competitor models in this price range. It’s safe to say that the sE2200a II C delivers audio quality of microphones that are noticeably more expensive, which is something you can rarely say in the world of musical equipment. 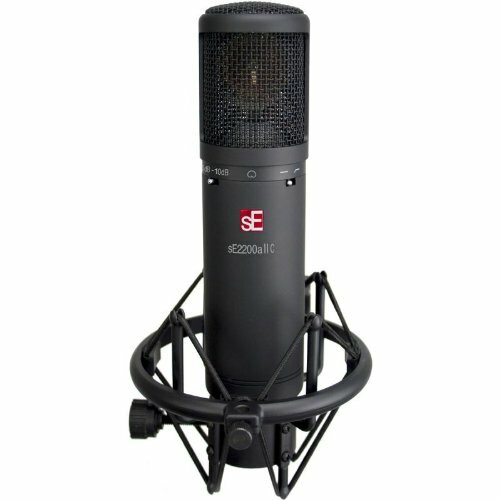 ​If you’re looking for a high-quality microphone for recording harsh metal vocals, or simply need a mic that can handle loud audio sources, the sE2200a II C by SE Electronics is a safe bet. Next up is yet another model from AKG. The Pro Audio C214 comes at double the price of the P420 we’ve mentioned at number 2 in our review. The question now is: Does the C214 offer double the performance, and is it worth buying? Well, if it wasn’t good, we wouldn’t include it in our reviews, would we? Sporting, once again, pretty similar specs to the Rode and SE Electronics models, the C214 offers more of a plug and play experience, being very easy to use and handle. It’s the low-cut filters where this model really shines. Offering 160Hz and 6dB of low-cut, you can really capture each and every detail, whether it’s just plain old vocal recording or any additional instruments you may want to include in your project. While the P420 offers switchable polar patterns, the C214 sticks only to cardioid. So, if your focus is more on the clarity and detail, and less on the obvious versatility that the P420 offers, this model is a great option. It’s definitely hard to compare products that are this far apart in terms of price, but the specs and extra features should help you form a rough image of the difference in performance. The C214 by AKG provides you with a performance worth every penny spent. With most of the microphones in our review being condenser ones, it’s time to take a look at some of the best dynamic models on the market. And what better way to do so than with the MD421 II by Sennheiser? Yes, it may be marketed as a microphone primarily meant for recording drums, but the sheer power and wide range it provides makes it very useful for recording vocals. We’ve mentioned the sE2200a II C by SE Electronics as the go-to mic for loud sounds. But the MD421 II really takes the cake. Another very useful feature that is coupled with the high SPL rating of this modes is the bass roll-off switch. With 5 different positions and presets to choose from, you can record pretty much any type of vocals and safely expect them to sound amazing. This model is a perfect example of what we mentioned at the beginning of our article. The MD421 II can be used for recording just about anything. Most of the models we’ve mentioned are, obviously, focused on vocals, and mostly acoustic instruments. With this microphone and it's features, you can easily go from vocals, drums, and even electric guitars for a unique approach and resulting recording. Growls? Screams? Fast rapping? The MD421 II has got you covered, whether it’s vocals or pretty much anything else. Before actually browsing the various models on the internet, it’s crucial to know exactly what you’re looking for. In order to better understand, and know what different specs mean when you actually use the microphone, we highly suggest you go over this part of the article first! Starting with the basics, there are two main types of microphones you can get. Dynamic microphones are the ones you’ve probably already come across. The main advantages of this type are that they are usually more capable of handling sound at higher volume levels. They also perform better in terms of noise rejection. Condenser microphones, on the other hand, are able to pick up more audio detail, but, unlike dynamic ones, don’t perform that well with loud sounds. Don’t forget that condenser mics require additional “phantom” power for them to operate. This means that you will have to make sure that the devices you plan on using the mic with offer this feature. Condenser microphones also tend to be a bit more expensive as well, which is especially important if you are on a tight budget. While we could go into more detail when it comes to the differences between these two types, this much information is going to be enough for now. If you’ve ever dealt with audio equipment before, chances are you are familiar with the concept of frequency response. Much like headphones and the frequency range in which they are capable of producing sound, microphones have a range of frequencies which they are able to pick up. In most cases, you want a microphone with a frequency response graph that’s as flat as possible. This means that the lows, mids, and highs are picked up and processed equally, with no part of the spectrum gaining additional boost or getting left behind. However, certain occasions call for a slightly different performance. Vocals that are rich in bass will have an easier time recording with a microphone that offers a good low-end response. The same applies to vocals with a more high-pitched sound, you’re just looking at the other end of the spectrum. The general frequency response most mics offer is around 20Hz – 20kHz, so you can use that as a baseline. As sound is basically a wave that spreads mostly in an even fashion through the air, the way that a microphone picks up those waves, and the angle at which it does this is an important thing to consider. The polar pattern of a microphone describes the sensitivity at which it “hears” sound coming from various angles. Think of it like a bubble around the top of the mic, that can be in shaped differently across various models. Cardioid microphones capture the sound that’s coming from the front, while they “reject” any sound coming from other directions. They are most commonly used for recording vocals, simply because the sound is coming from only one angle. Other polar pattern types include the figure 8 and omnidirectional ones, that focus on more than one source of sound. These may come in as handy if you plan on recording more people at once, whether it’s a choir or backing vocals that have multiple people involved. SPL, or sound pressure level, describes the highest level of volume of the input sound the microphone is able to pick up without the signal getting distorted and starts losing quality. While, unless you plan on recording aggressive and brutal vocals, this factor may not play an important role, having a versatile microphone in terms of SPL is a good idea. Most good microphones have a switch that toggles the sensitivity and the maximum SPL, so you can adjust it in accordance with the occasion. This means that you can practically use one microphone for various situations, ranging from recording vocals to other instruments as well. So, if you are on a tight budget, saving up for a microphone with attenuation pads is often a better idea than buying two or more mics for recording vocals, guitar, or drums, as you can cover all that with just one device. A pop filter is essential! A pop filter is that “windscreen” that you place in between the vocal and the microphone itself. While it’s a very important piece of equipment, it’s sad how many musicians either forget about using it or simply don’t understand how necessary it is. By using a pop filter, you block the unwanted air that hits the microphone when a person pronounces certain sounds and syllables. The “pop” is usually very noticeable, and it leads to signal clipping, which can either be very hard or impossible to get rid of when you start mixing the tracks. While many mics come with a pop filter included, their actual quality can vary to a large degree. So, your best bet is to spend some extra cash and get yourself a proper one. Much like with other pieces of musical equipment, the price often dictates the quality. While you can get a decent mic for recording vocals around $100, it’s important that you are aware of the specs and features that may come as crucial for your exact needs. As we’ve already stated, sometimes it’s better to wait, save up more money, and get a microphone which offers a higher level of versatility and can be used for more than recording vocals. In the following review part of the article, we went over various models from different price ranges, so we are sure that you will find just the right one! So, we’ve had the chance to go over some of the best microphones for recording vocals. The best budget microphone - MXL 770, offers great sound quality and is very versatile. If budget is your main concern, save up for this model. 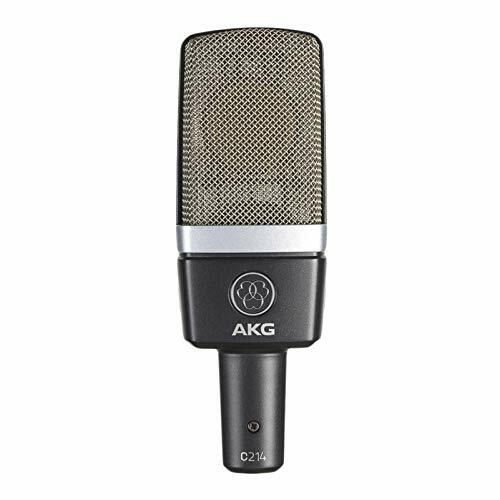 The best versatile mid-range microphone - AKG P420 – The fact that the P420 offers switchable polar patterns makes it amazing for recording single vocals, as well as multiple people. The best microphone for heavy music - Sennheiser MD421 II, features unmatched versatility and deals with loud audio input easily. At the end of the day, it’s really up to you to think about the features and specs you find to be the most important for your needs and choose accordingly. We hope that you found this article informative and that it helped you in choosing just the right vocal recording microphone for your needs.